I’m often reminded of how fortunate we are to have an incredible wine-producing haven right in our own backyard. With over 200 operating wineries in British Columbia, we aren’t hard-pressed when it comes to selection, but how do we know what to try next? Look no further. Here is a list of some of my favorite affordable BC wines that will satisfy your palate and your financial advisor! Refreshingly fruity and off-dry with a squeeze of lemony acidity – pack the picnic basket! Your take out Thai Food has never tasted better than with this spicy, aromatic white blend. You say you don’t like chardonnay? Well you will like this one! Clean & crisp with white peach & just a hint of oak. Bursting with apricots, mango and orange blossoms! A divine partner for spring salads & shuffle boards. Luscious and lively with a whiff of jasmine & honey – great with BC spot prawns! Soft & silky with a crack of black pepper – throw some wild salmon on the grill! That’s right – a beautiful and bold BC red for $20. This is not a joke. This luscious red will almost certainly make a Cabernet Franc lover out of you – you’ll see why! Ripe and ready to drink, this silky Syrah would love an invitation to your next BBQ. Hello lamb kabobs! Spicy and savory with black cherries & food-friendly acidity. Pizza night just got better. 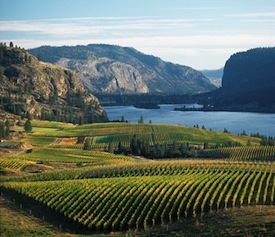 Want to engage in real time with BC Winemakers, Sommeliers, and every day wine enthusiasts? Jump on twitter and join in on #BCWineChat every Wednesday from 8pm-9pm. Follow @SandraOldfield for more information. This post was written by @HintsofHawthorn. Tweet at Sommelier Emily Walker with all your wine-related questions.